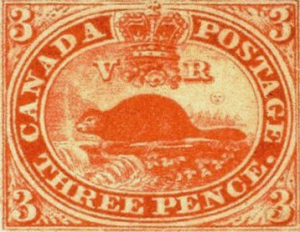 Stamps bearing the name of “Canada” began to appear in 1851, 11 years after Britain began issuing stamps in 1840. They began issuance as colonies of Britain. While these may be the first stamps to use the name “Canada,” they are not actually the first true Canadian postage stamps of the nation we know today. Rather, they belonged to the Province of Canada, which was formed under the Union Act of 1840. The Province of Canada was formed with the unification of Lower Canada and Upper Canada and became known as United Canada until 1867, when it joined the Canadian Confederation. This resulted in the split of United Canada into the modern day provinces of Ontario and Quebec. There were several other Canadian provinces in existence during that time period as well, including Newfoundland, Prince Edward Island, Nova Scotia, New Brunswick, British Columbia and Vancouver Island. Other postage stamps from Canada emerged as classic issues with the formation of the Canadian Confederation. During the intervening time period before the Canadian Confederation came into being, each province issued its own Canadian province stamps. For example, the Province of Canada issued a variety of stamps that can be placed into four general categories, based on what they depicted. The first is one of the earliest symbols of Canada, being the beaver, which is typically shown building a dam. Other subjects included Prince Consort Albert, Queen Victoria, and Jacques Cartier, a French explorer who claimed the territory along the Gulf of St. Lawrence and the river for France. Another province that issued stamps was Newfoundland. Their first stamps emerged in 1857, and they continued to be printed until 1949, which is when Newfoundland finally joined the Confederation. This made Newfoundland the 10th Canadian province. During that time period, the province issued nearly 300 different stamps, which still remain valid for mail posted in Canada today. New Brunswick is another example of a province that issued its own stamps first, which began in September of 1851 and lasted until they joined the Dominion of Canada in 1867. One stamp from the issues of this province that is widely sought is one issued by Postmaster Charles Connell, who issued stamps with his own image on it instead of the image of Queen Victoria. These stamps were recalled, with most of them being burnt, except a few kept by the postmaster as a souvenir. Another unusual fact about these province stamps is ones issued by the Colonies of Vancouver Island and British Columbia. In 1860, these colonies co-issued stamps that contained both of their names, citing economical reasons for consolidating the two. Vancouver Island went on to issue its own stamps, in 5- and 10- cent denominations, in 1865. If Treasure Coast Stamps can assist you with any of your questions about Canadian stamps, please do not hesitate to contact us.